Does your business promote error tolerance design in CX? For example, the Apple lightning connectors that literally dont have a wrong way to plug in. Or the related concept of behaviour-shaping constraints e.g. a car transmission that needs to be in ‘Park before the key can be removed. These are well-established concepts in design and manufacturing, that can bring advantages to a company in almost any arena. Micah Solomon, a contributor to Forbes Entrepreneur details his experience in his article “Become ‘Error-Tolerant’ Like Apple And Mercedes: A Customer Experience Designer Strategy“. Solomon, after a rather satisfying business day, very nearly locked his keys in his boot, only to find that the boot would not close with the keys in it. The designers of his vehicle had cleverly included this feature, to assist drivers in avoiding the ultimate ‘day ruiner’, locking the keys in the car. His acknowledgement of the benefits of this technology ignited his interest in writing about it. 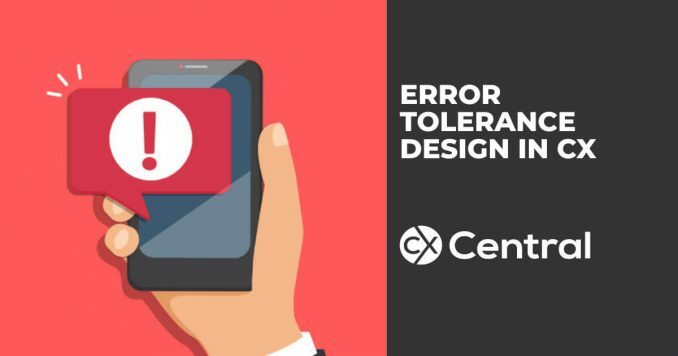 For the call centre arena, why not apply some of these principles of error tolerance design in CX? When someone fills out an online form why not correct their typing for them? If thats too hazardous (as it would be when names and other proper nouns are involved), at the very least, use capitalisation correction. Nobody wants to end up in a company database as (and later get correspondence addressed to) jOhn smiTH simply because they were struggling to enter their name and address using a mobile keyboard, late at night or on the run. Why not reduce the character set you use to generate serial numbers? In my opinion, there shouldnt be any 0s, 1s , or other easily-swapped characters used in serial numbers. They too easily become Os and ls. Which, of course, means there shouldnt be an Os or ls either. In a sense, an omnichannel approach is error-tolerance manifested. Of course, customers dont consider it an error to purchase at your cash register in-store and then return from their doorstep, or to start a conversation with you on the phone and then expect to be able to continue it by email (with you retaining all the details of the phone call so they dont have to repeat themselves), but these are challenges to your processes that you need to overcome, rather than making the customer do the work. Error tolerance via empathetic, well-trained employees: In a sense, one of the most important error-tolerant design moves you can make in customer service is to hire the right people and train them the right way, making it clear to them that they arent there to judge or correct their customers (except in matters of life, death, safety, security, or fraud), but to support their customers and, in the cases that errors do need to be corrected, to make the error seem minor and understandable.